For the fruit tree, see Campomanesia phaea. For the district, see Cambuci (district of São Paulo). 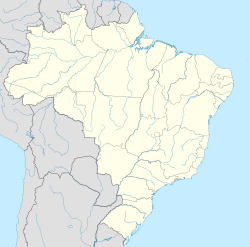 Cambuci (Portuguese pronunciation: [kɐ̃buˈsi], Cambuci Berry) is a municipality located in the Brazilian state of Rio de Janeiro. Its population was 14,439 (2005) and its area is 562 km². The calculated population for 2009 was 18,256. It is a popular destination for tourists.